Every time I travel, I try to get into my “adventure with GOD” mindset: I pray and ask GOD to make me hyper-aware of the people that HE brings across my path. I believe there are no coincidences, only God-incidences, and I want to have my antennas up and ready for them. In February, while boarding the shuttle that would take me on my way to a conference in Orlando, FL, I noticed that the driver was of Middle Eastern descent. One click glance of the empty seats and it was obvious it would just be the two of us for the next hour. Soon, my conversation with the driver moved from small talk and the weather and I learned that Ben (had he changed his name when he came to America?) was from Iran, but that he’d been here in the U.S. for about five years with his wife. The rest of his family was still there. I told him about mine, too, and showed him the picture of my granddaughter. He said he really liked it. That’s when he got surprisingly honest, responding that he and his wife had been trying to have children but without any luck. I could hear the discouragement and hopelessness in his voice. So I asked if he would let me pray for him. He said Yes. Right there, I prayed. The tears in his eyes were a big indication that God had touched him. When our time was over, I gave Ben my business card, a bigger tip than usual, and said, “Please email or call me when you find out that you’ll be having a baby.” I haven’t heard yet, but I expect that I will! My week at the conference passed, and again, I was waiting for a shuttle. When another man of Middle Eastern descent drove up and opened the door, I felt my excitement at the prospect of another God-incidence. But this time God really surprised me! He opened the way for me to boldly share about Jesus in a lovely, easy exchange about the differences between Islam and Christianity. GOD’s loving work is evident all around us. Ours is just to ask HIM to help us slow down, be intentional, and keep us aware so we don’t miss the opportunities that HE puts before us to love. Awesome story, Jenine…where you practiced the Art of Loving in such a beautiful way. Thanks for sharing! I shared it on my facebook account for more to see. Thanks. 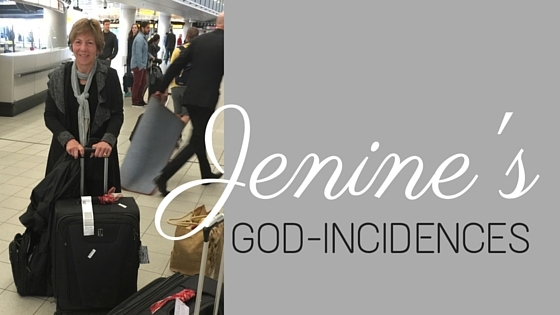 I love this story, Jenine, and how you are intentional and focused on your God-incidences! Way to go! It is such an encouragement to all of us that we, too, can do this…it is just a matter of “staying tuned” to our God and practicing our “9 Arts”. He does the rest. Hey, Jenine, “you da God watcher”. WAY TO GO, girl.